What does it take to unite people around a common cause? Are tales of shared ancestry or the threat of a common enemy the only way, as religions as governments have been assuming far too long? Here are some glimpses of how commitments towards a cause can be kindled and how divisions can be made irrelevant, without resorting to evangelical or apocalyptic narratives, but by the simple process of identifying with a human story from beyond borders. The wisdom with which humankind must connect to save us from ourselves, is not something we must strain to hear in the obscure tongues in which seers and prophets of old spoke, but something that rings forth in the earthy, everyday voices of people who are distant and yet familiar, like Shunsaku Anchan speaking ardently on the futility of war or Grandma Kuni speaking admonishingly on the criminality of waste. Neither of them is a revered preacher or an anime superhero. Both are characters from the Japanese teleseries Oshin1a. Oshin was a household name in India in the early 1990s. The name of the title character of the record-breaking Japanese teleseries aired in an English-dubbed version on Doordarshan in the 1990s, is remembered by a generation of Indians almost like that of a person they knew in real life. The show itself unfolds as a series of flashbacks by Oshin as an elderly grandmother reminiscing to her curious grandson about the vicissitudes of her life that was checkered, but lived with spotless dignity and undimmed determination. This wholesome and inspirational production offers a bildungsroman, a historical novel of sorts, a family drama and a heroic saga in a story endearingly well-suited for family viewing. When I looked up the series on Youtube1b giving in to nostalgia, I was pleasantly surprised to learn from the comment trails that it was not a just a generation of Indians for whom this was a cherished memory, but also Malaysians, Pakistanis, Sri Lankans, Vietnamese, Ghanaians, Iranians and Uzbeks to name a few! I later learnt that the show was aired in as many as 59 countries. When most Youtube comment-trails offer up a jingoist and partisan cacophony, seeing border-crossing bonhomie initiated by the Youtube uploads of Oshin makes one smile in the face of cynicism. Those people could share such joyful reminiscence with people from other nations they couldn’t point on a map, or even nations whose sight they can’t stand on the map. What makes people even of warring nations forget their differences while watching this show, is not just a single dialogue like the impassioned imploring of the conscientious army deserter Shunsaku Anchan2a that “War is not the answer” to resolve differences. The forgetting of differences is thanks to some reminders which suffuse this show’s every episode in both their everyday settings and their unsettling moments, reminders of the essential sameness of the human condition regardless of borders. This cultural product which people of a divided world together recall with fondness, is an unsung triumph of secular humanism in its own right. This series can be thought of as a resource for the secular humanist project of cultivating ‘educated feeling’3 and complementing Reason with Compassion. The story itself can be viewed as an affirmation of a humanist worldview and abounds in compelling illustrations of universal values whose precepts and practice supply the theme of this article. Do read on even if you are yet to watch this heartily recommended show, for this is not a review with spoilers; but assorted reflections which were occasioned while viewing it. These are reflections on reason-based alternatives to many cultural and social functions which have traditionally been seen as the preserve of religion and nationalism. 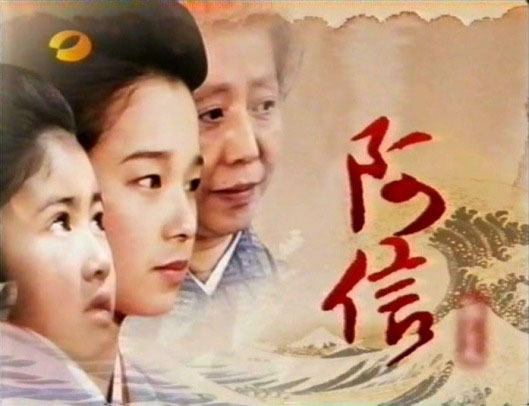 Oshin teleseries poster with portraits of actors playing Oshin at different ages. Image via Wikipedia Farsi. Click for source. An essential ingredient in the process of nation-building, is the creation of a shared narrative of common experience. A collective ritual viewing of nation-defining symbolism asserted with pageantry, such as nationally broadcast Republic Day parades, is one of the most traditional means of creating common experience. An even more traditional means is a retelling of the epics belonging to a people’s lore, which supplies to them their most recognizable metaphors and in a sense shapes the language they speak. India is a land with lores galore rather one unifying ancestral tale, and a land of ‘million mutinies’ according to V S Naipaul. State television in 1980s India implemented a number of successful experiments to create common experience of the sort common people could identify with, such as Buniyaad4a articulating the anguished birth pangs of a newly formed and newly divided nation and Hum Log4b which can be a seen as a national hearing out of the fears and hopes of a family most in India could identify with. The television of adaptation of Tamas5a was intended to be a timely reiteration of the painfully learnt lessons of Partition, and according to the author of the original novel Bhisham Sahni5b, a chronicle of a struggle between the simple human decency of unsung commoners and the inhuman piety of supposedly learned defenders of faith. Tellingly, these successes demonstrated that a shared corpus of common experience could be built without exclusive resort to heroic epics6 that are so readily appropriated by revivalists7 who are also eager to usurp the writing of the nation’s history and even of its future. In this context, the success of Doordarshan’s broadcasts of Oshin in capturing the imagination as well as the empathy of so many Indians is even more telling, as it shows how the common experience that goes into nation-building, need not be limited by parochial considerations and can draw freely on the learning of distant peoples in the comity of nations. The potential of television programming to direct if not define society’s narratives was recognized perhaps first by propagandists and only then by artists and educators. Though television has a more recent history in the developing world than other media such as cinema or novels, there are some television offerings with a staying power that should earn them a place in history the way ‘literary classics’ or ‘cult movies’ have. It may seem like romanticizing to consider television offerings like Oshin part of ‘the intangible heritage of humanity’, but to reserve that designation only for works that have acquired the veneer of venerability that antiquity provides would be to overlook the continuity of ‘popular culture’ with ‘cultural heritage’. Vedic chanting was recently designated by UNESCO8 as part of the ‘intangible heritage of humanity’, for though the lyrical content of the hymns has been committed to writing, each rendition of it is a human creation in its own right, worthy of preservation on anthropological considerations. While a teleseries like Oshin is indeed committed to reels and records, every retelecast and viewing of it is an opportunity for acknowledging the triumphs and tribulations of the human condition, and hopefully, an opportunity thereby to cultivate a degree of empathy in human affairs. In our times in history which are uncertain for most and troubled for many, such creations of popular culture that reaffirm faith in humanity are no less worth cherishing and passing on, than other human creations from deep antiquity enjoying an institutional seal of approval as deserving of posterity. Speaking of a Japanese teleseries from the 1980s, and the Vedas which are thought of by many in India as eternal revealed scripture, both in the same sentence, may seem incongruous to some. However distinctions between the supposedly sacred and profane are perhaps less relevant to a troubled world than the distinction between the obscure and the accessible, between the alienating and the all-embracing, and between the authoritative and the empathic. One of the areas of contention in the culture wars in secular democracies is to what degree, if at all, can ‘value education’ in schools9 draw on religious sources for morality. While it is true that one of the readiest aids for ‘moral science’ education is stories each with a ‘moral of the story’, there is no compelling reason why these stories must be drawn from myths, which contain a questionable mix from which precious little of what we may recognize as morality today is extracted rather painstakingly and dubiously. Come to think of it, a serial like Oshin lends itself to viewing as continuing moral education, in an unforced way that supplements learning from life experience. Aspects of this very human story endowed with both child-appeal and adult sensibilities, offer compelling illustrations for human values centered on human solidarity beyond differences, humanistic values that uphold human dignity over convention or tradition, and humanitarian values intent on advancing human welfare by overcoming inevitable as well as human-made suffering. Indifference to the labours of our fellow human beings is a crime which many of us Indians of today can be justly charged with, and P. Sainath’s documentary Nero’s Guests is a damning indictment of this11. It takes only a child to understand that there’s something wrong with a world in which ‘Trading rice is a good thing, but growing rice is not.”2c Underlying such indifference to human labour is something even more deadening; a denial of humanness itself of those from whom we are divided by barriers of class or creed. It is a denial which translates into denial of opportunity even to innocent children across these divides, and makes even a child potentially availing of the access to education provided by legislation like the Right to Education Act12a, seem a threat to educational standards and the established order. For those parents, and verily those educators12b, who end up seeing a poor student as a threat to their children’s schooling, there are lessons aplenty to be learnt from Matsuda-san, the teacher whose classroom had room for the child-labourer Oshin working as a nanny2d. They can also learn from Grandma Kuni who could recognize and respect potential that was obscured by poverty2e and taught the maid-servant Oshin alongside her own grand-daughter with the same affection2f. Living as we do in a society where segregation still deprives children from the benefits of school meals13 and free education, for no fault of theirs, Matsuda-san, the epitome of the true nurturing role of an educator2g, is someone who direly needs to be emulated manifold. This lesson of reclaiming humanness is one that needs to be drawn from any source at every opportunity, even if it be as unlikely-seeming a source as decades-old televised Japanese fiction, because without such an awakening of conscience, any grand scheme of secular humanism would itself remain a fiction. Little Oshin and the elderly Oshin are both our guides, one as a reminder of human potential whose fulfilment is our collective responsibility; and the other, as an exemplar of human resilience and resourcefulness which we must endow ourselves with in abundant measure to meet the challenges that now separate us from the best humans we can be, and from the just society we wish to build. From my own attempts at translation and subtitling, I can appreciate how demanding the effort of the uploader is. very nice article & a point well made! thanks for refreshing the memory 🙂 am from that time period & i very much remember being exposed to the cold cold “western” world through Oshin! Speaking of cold and snow, the first time I heard of it was via that other Doordarshan classic, Gul Gulshan Gulfaam set amid the houseboats and chinars of Kashmir. These rooted productions suffused with the sights and sounds of a place however distant, seem to have an appeal difficult to attain any other way. David Brooks in the New York Times calls it the ‘Power of the Particular’ in this very vivid piece. “I don’t mind if I don’t have lunch. I wouldn’t quit for a thing like that.” Oshin’s resolve to attend school at any cost gave me the goosebumps. Thanks for writing this Arvind. It was a pleasure reading it. And every link was worth following. It is heartening to note that this is something you are able to cherish with your daughter. While first watching Oshin, it was a sort of love-hate relationship (Which eight-year-old wants to be reminded by elders in the house to be ‘well-behaved and mature’ like Oshin? 😉 ), but watching on Youtube now is a joyous reunion! In the spirit of Kahlil Gibran’s wish: Keep me away from the wisdom which does not cry, the philosophy which does not laugh and the greatness which does not bow before children., this seems a wise viewing choice indeed! This article may have been written too long ago to get many views but I’ve been hunting down Oshin. My mom used to watch it when it aired (at the time dubbed in English). Much of what was online has been scattered and/or removed. It seems that most people don’t have the RAWs, let alone a complete translation in one language or other. I’ve found some of it in Vietnamese. I remember very little of the show. I guess when it used to air, I was always doing something else. Does anyone know if it is currently being aired? Does anyone have a collection of srt files for the entire series? The episodes in the references of the article are available in alternative locations like this one . A lot of this is the work of individual uploaders, due to which subtitle quality can be variable and long-term availability is far from guaranteed. I’m yet to see to complete series available online with subtitles though. This article may have been written too long ago to get many views but I’ve been hunting down Oshin. My mom used to watch it when it aired (at the time dubbed in English). Much of what was online has been scattered and/or removed. While revisiting the post, I was pleasantly surprised to discover that the Oshin links have been restored. Enjoy! The link to Raam ke Naam (Ref. #7) has expired, but for a good reason, since the documentary-maker Anand Patwardhan has himself made the documentary publicly viewable here.